I know that Photo Fridays I usually only share photos from the week, but I had to share this with you today. I went to a great little party by my dearest friend Kristin from Our Ordinary Life sponsored by Snapfish! We all recieved little swag bags and in them we got coupons for a free 8×8 book. I found a new love! Now I know what I want as my present for each holiday from my hubby! I wanted to share my experience with Snapfish and their books because I loved it so much! It’s been my best photo book experience ever. Here is the cover which turned out so wonderful! 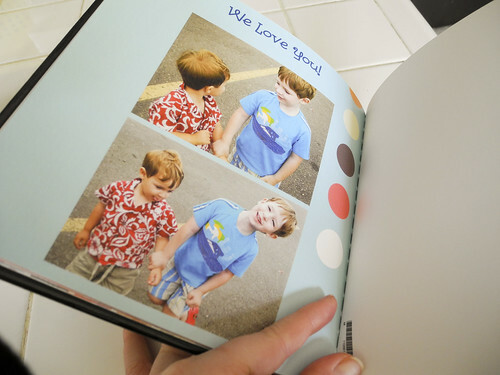 I loved how I could add photos to the front of the book. 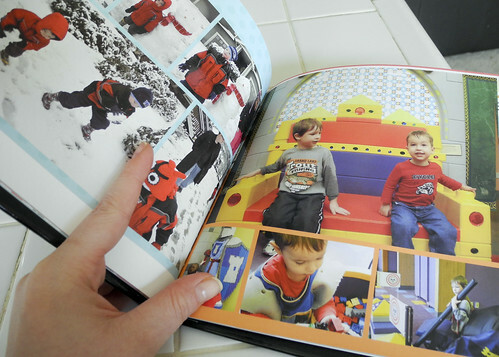 One of my favorite things was the Autofill feature on their photo book designer. It’s actually made to be smart and put like photos together. 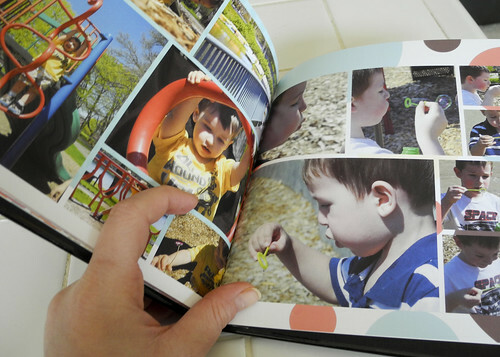 I have tried making photo books on other sites and one of the hardest things to do is get all the photos in the book and in order. 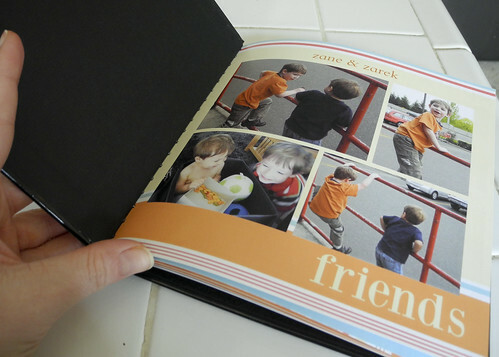 Before my Snapfish experience, I dreaded making photo books, they would take me hours to make. If I wanted to add a picture to a page I could just drop it on the page and the photos would shuffle to make room like magic. I could also change the layouts by selecting one from a menu that was separated by number of photos and added text. I liked I had the option to add text or not. 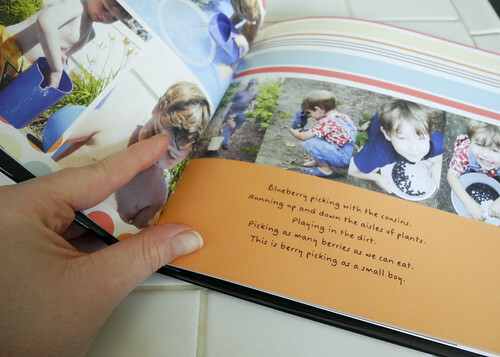 On this page I shared the memory of a day out blueberry picking with two small boys. I was so happy with how the large photos printed. I loved this picture of them sitting together on that Lego throne and wanted to highlight it on this page. With a quick drag and drop I was able to switch the photos into the spaces I wanted, making sure the photo of them together was the main focus on this page. It was so easy to edit the photos within the layout if needed also. The picture below is a great example. The photos on the right were an off bluish color, as they were shot in an aquarium. The colors clashed with the bright orange and yellow colors in the photos of the jellyfish. I changed the aquarium photos to black and white and the page turned out great! Another great thing about the layout templates was that you could get lots of photos on one page and since I take way too many photos this was great for me. I didn’t have to stress over which photos to take out and which to keep. This is my Snapfish experience I hope that you enjoyed seeing my photos actually printed out. I really did, seeing these books made me realize I take lots of great photos, but so many of them just sit on my hard drive where only I get to enjoy them. I am realizing I need to print more of my photos and I may make a challenge for myself to start printing my photos. How often do you print your photos? 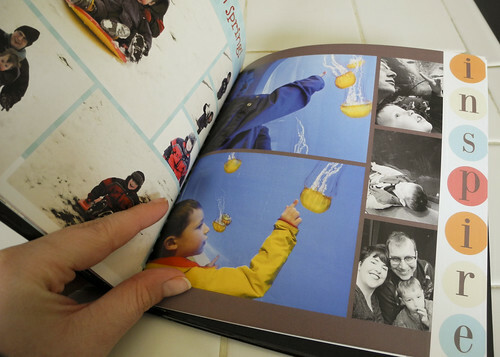 Do you wish that you printed your photos more often? What stops you from printing them? Those are real cool books. I recently done two photobooks. One for my gal from her birth to now and the other documenting our holidays taken rom 2011-2012. They really do help me organize the photos which I have taken and it’s so much easier to share them with guest. O.M.G. That is the COOLEST thing EVER!! I never print pictures and it drives my mom CRAZY!!! She’s always wanting REAL pictures… she doesn’t even have a computer. 🙂 This would be an outstanding gift… and it looks so easy to use. I usually make her a picture calendar every year for Christmas, but they’re hard to save and archive for future looking… but hey ~ a book fits right on a shelf. 🙂 I’m going to have to try one of these out. Thanks for the heads up Pepper!! I can see some beautiful photo books. I’ll be happy if you share the enlarged version of those photos.